There’s loving your dog…And then there’s spoiling your pooch. I’ve seen both types of puppy love in San Francisco. I found this well-loved poodle at the edge of North Beach during last month’s Noodle Fest. I was impressed that the pooch didn’t beg for samples. 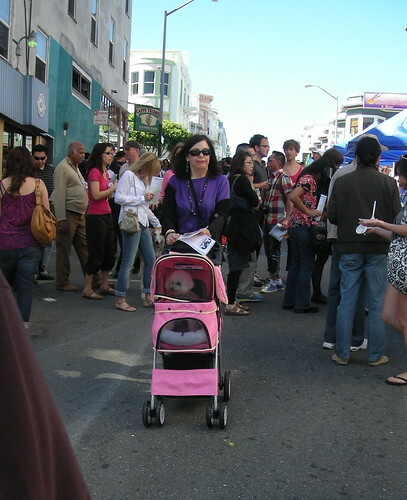 She stayed calm inside her pink carriage as crowds of people who lined up for bowls of fettucini, risotto and ravioli. Inside her happy space, the poodle simply enjoyed the sites, sounds and aromas of a festival that showed off North Beach and Chinatown cuisine.